IKEA has big growth plans. 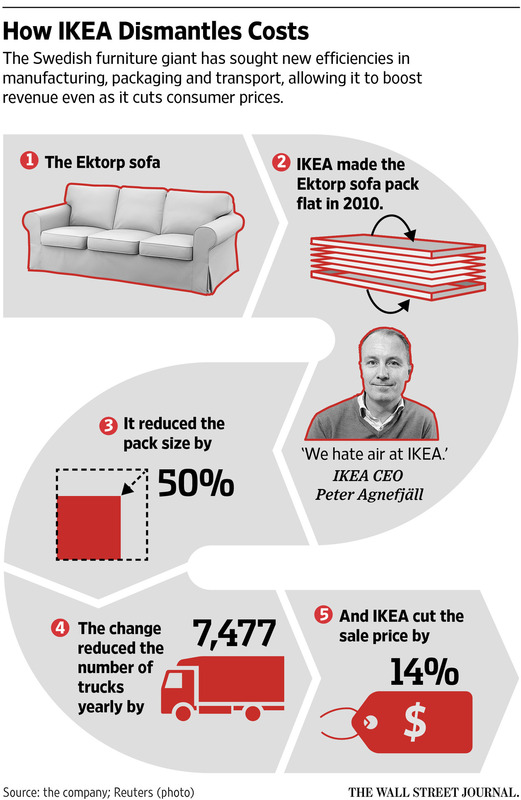 According to the Wall Street Journal, it aims to increase its revenue by €50 billion by 2020 — 74% higher than its 2014 revenue (IKEA Can’t Stop Obsessing About Its Packaging, Jun 17). Part of that growth is going to come from expanding into new markets, some may come from new formats, but a lot of it has to come from selling more stuff through existing stores. And that is going to require finding ways to cut prices to move more volume. That’s where design comes in. IKEA is reviewing products in order to find ways to reduce their production and — importantly — their distribution costs. As this graphic demonstrates, this is pretty much a war on air. Just how many meatballs does IKEA sell? Most of us think of IKEA as “just some oak and some pine and a handful of Norsemen selling furniture for college kids and divorced men” but they also move a boat load of food. The Wall Street Journal reports that with food sales of around $2 billion per year, they are around the same size as Panera and Arby’s (IKEA’s Path to Selling 150 Million Meatballs, Oct 17). Just why and how did IKEA get into the meatball business? Check it out. And here’s the reporter with a little more information explaining how IKEA has grown its food business. Ikea: Why is it so bad at delivery? The nightmare of Ikea delivery is a truth so universally acknowledged that even the company cops to it. Chief marketing officer Leontyne Green talked about her own “very frustrating” Ikea delivery experience in a December 2011 Ad Age profile, which stressed the firm’s ongoing efforts to improve delivery and overall customer service. “With sporadic orders over a wide geographic area, Ikea would need a fleet of trucks that might be idle one day and not able to handle the load the next,” says Robert Shumsky, a professor of operations management at the Tuck School of Business at Dartmouth.